A TreoCentral forum post points to a new set of large Palm Pre shots, curiously found outside of its usual Palm decorated lounge space. 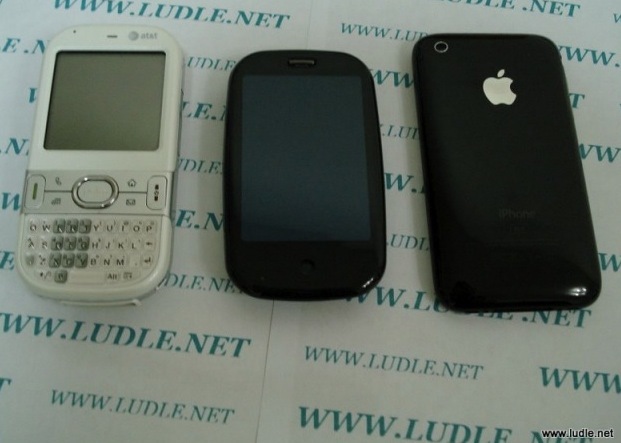 The shots were first pointed out by a Chinese enthusiast site, Treo8.com and come from an electronics accessory manufacturer in China called Ludle International. The two high res photos show the Pre situated along with a 3G iPhone and a White Palm Centro. It's not entirely clear if it is in fact a working model, mockup or a possible dummy demo model. I like the idea of it being small form factor and think alot of people will be surprised to see how small it is (with keybd closed). The size is excellent! It makes the Treo look like a garbage truck and the iPhone look big. There's other stuff I'd like to see (a better keyboard, a few more hard buttons on the surface of the Pre, IR port etc) but we all know that Palm (just like Apple) are not going to budge on those aspects. As it stands, formfactor-wise, a Pre of any size still beats carrying 2 devices or most of its primary competition. Do note that I am ONLY talking about the "pebble" shape and its slide-out keyboard, not the OS/UI/apps/performance etc. When I go back to a converged device, the comfort of the device in-hand is going to be critical for my purposes. The 680/750/755 Treos fit very nicely in the hand despite their girth and relative clunkiness. I even sorta liked the feel of the Treo 800w and the Pro. The iPhone 3G is OK but could still stand to gain a bit of curviness. And the BB Storm is just horrid to hold, and the Bold isn't much better (too wide). I am rather fond of the G1's "bent" design, actually. we still haven't seen how thick the device is going to be. By the look of the second photo.. it looks like the Pre is going to be perfect for old men with liver spots who no longer feel the need to cut their finger nails. All that and Sprint too! Yay.